THE ASTRA PLANETA were the gods of the five wandering stars. They were named Phainon (planet Saturn), Phaethon (planet Jupiter), Pyroeis (planet Mars), Eosphoros (planet Venus) and Stilbon (planet Mercury). 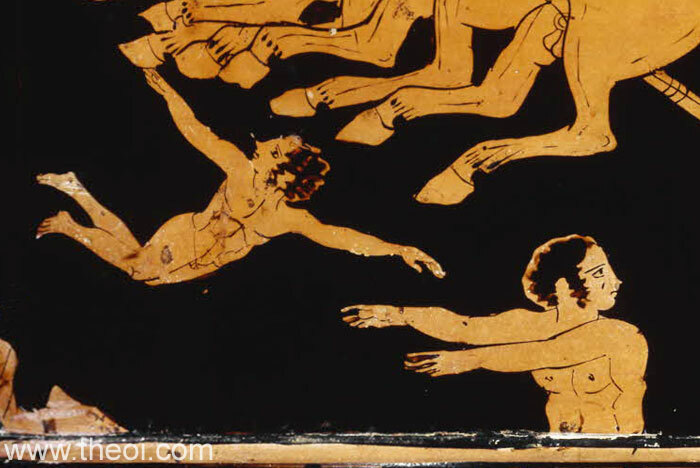 In ancient Greek vase painting they were depicted as youths diving into the earth-encircling river Okeanos (Oceanus) before the rising chariot of the sun-god Helios. The three remaining planets--Uranus, Neptune and Pluto--are invisible to the naked eye and were only discovered and named in modern times. Sokrates (Socrates) : Let us inquire what thought men had in giving them [the gods] their names . . . The first men who gave names [to the gods] were no ordinary persons, but high thinkers and great talkers . . . But why should you not tell of another kind of gods, such as sun, moon, stars, earth, ether, air, fire, water, the seasons, and the year? . . . I think the stars (astera) get their name from astrapê (lightning). But astrapê, because it turns our eyes upwards (ta ôpa anastrethei), would be called anastrôpê, which is now pronounced more prettily astrapê." "He [Orpheus] sang of [the creation of the cosmos] . . . how the Astra (Stars), Selene (Moon), and travelling Helios (Sun) keep faithfully to their stations in the heavens." "But of quite a different class are those five other orbs [the Planetoi (Planets)], that intermingle with them and wheel wandering on every side of the twelve figures of the Zodiac. No longer with the others as they guide couldst thou mark whee lies the path of those, since all pursue a shifty course, and long are the periods of their revolution and far distant lies the goal of their conjunction." 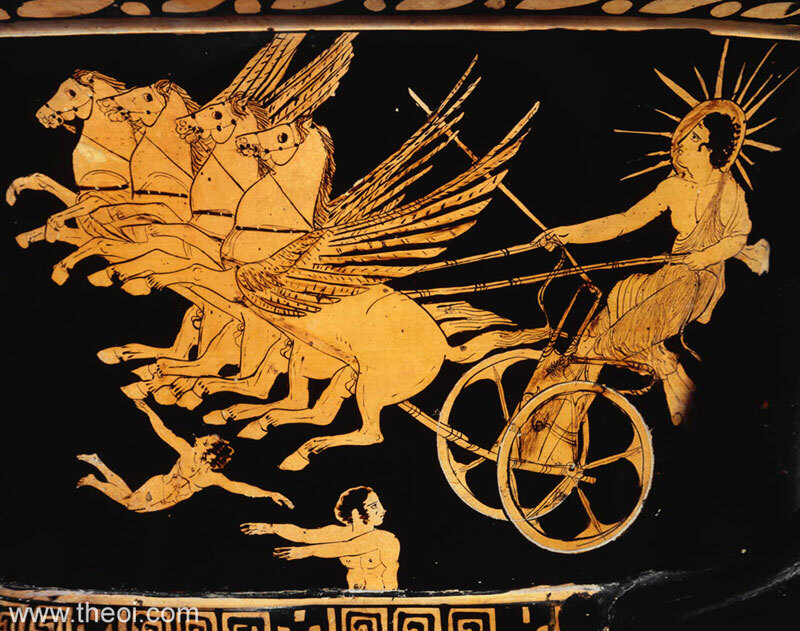 "[From a description of an ancient Greek painting depicting the fall of Phaethon :] In his passion for driving this son of Helios (the Sun) [Phaethon] ventured to mount his father's chariot, but because he did not keep a firm rein he came to grief and fell into the Eridanos . . . Look! Nyx (Night) is driving Hemera (Day) from the noonday sky, and the Sun's orb as it plunges toward the earth draws in its train the Astera (Stars) [i.e. the five Planeta]." "To the Astron (Stars) [both the fixed stars and the planets], Fumigation from Aromatics. With holy voice I call the stars on high, pure sacred light, and Daimones of the sky. Celestial stars, dear progeny of Nyx (Night), in whirling circles beaming far your light; refulgent rays around the heavens ye throw, eternal fires, the source of all below. With flames significant of fate ye shine, and aptly rule for men a path divine. In seven bright zones ye run with wandering flames, and heaven and earth compose your lucid frames: with course unwearied, pure and fiery bright, for ever shining through the veil of Nyx (Night). Hail, glittering, joyful, ever wakeful fires! Propitious shine on all my just desires, these sacred rites regard with conscious rays, and end our works devoted to your praise." "‘Stars (asteres), bow to my prayer, and become sightless; Moon (mênê), suffer your light to sink swiftly and depart!’ So she [Hero] spoke, for to see Laandros (Leander) was all her heart's desire. Then did he too make supplication : ‘Back, Hesperos [i.e. the star Venus], to hiding!’--thus prayed Laandros--‘Ride backward, all the stars, that night and heaven and sun and earth may grow dark!’"
"Planets. It remains for us to speak of the five stars which many have called wandering, and which the Greeks call Planeta. One of them [the planet Jupiter] is the star of Jove [Zeus], Phaenon by name, a youth whom Prometheus made excelling all others in beauty, when he was making men, as Heraclides Ponticus says. When he intended to keep him back, without presenting him to Jove as he did the others, Cupid [Eros] reported this to Jove, whereupon Mercurius [Hermes] was sent to Phaenon and persuaded him to come to Jove and become immortal. Therefore he is placed among the stars. The second star [the planet Saturn] is that of Sol [Helios]; others say of Saturnus [Kronos (Cronus)]. 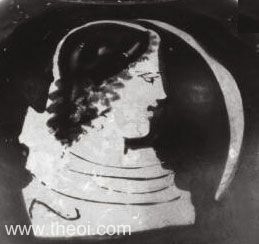 Eratosthenes claim that it is called Phaethon, from the son of Sol. Many have written about him--how he foolishly drove his father's chariot and set fire to the earth. Because of this he was struck with a thunderbolt by Jove, and fell into the river Eridanus, and was conveyed by Sol to the constellations. The third star [the planet Mars] is that of Mars [Ares], though others say it belongs to Hercules . . . Since she [Aphrodite] inflamed him violently with love, she called the star Pyroeis, indicating this fact. The fourth star [the planet Venus] is that of Venus [Aphrodite], Luciferus [Eosphoros] by name. Some say it is Juno's [Hera's]. In many tales it is recorded that it is called Hesperus, too. It seems to be the largest of all stars. Some have said it represents the son of Aurora [Eos] and Cephalus, who surpassed many in beauty, so that he even vied with Venus, and, as Eratosthenes says, for this reason it is called the star of Venus. It is visible both at dawn and sunset, and so properly has been called both Luciferus and Hesperus. This fifth star [the planet Mercury] is Mercurius' [Hermes], named Stilbon. It is small and bright. It is attributed to Mercurius because he first established the months and perceived the courses of the constellations. Euhemerus says that Venus [Aphrodite] first established the constellations and taught Mercurius." "Aurora (the Dawn) [Eos], watchful in the reddening dawn, threw wide her crimson doors and rose-filled halls; the Stellae (Stars) [Astra] took flight, in marshalled order set by Lucifer [Eosphoros] who left his station last." "[The witch Medea invokes the Sun, Moon and Stars in a spell :] When she [Selene the moon] shone in fullest radiance and with form complete gazed down upon the sleeping lands below, Medea, barefoot, her long robe unfastened, her hair upon her shoulders falling loose, went forth alone upon her roaming way, in the deep stillness of the midnight hour . . . Then to the stars she stretched her arms, and thrice she turned about and thrice bedewed her locks with water, thrice a wailing cry she gave, then kneeling on the stony ground, ‘O Nox (Night) [Nyx], Mother of Mysteries, and all ye golden Astra (Stars) [probably the five Planets] who with Luna (Moon) [Selene] succeed the fires of day, and thou, divine three-formed Hecate, who . . . dost fortify the arts of magic . . . be with me now!’"
"We must also assign the same divinity to the Stellae (Stars) [i.e. the fixed and the wandering stars], which are formed from the most mobile and the purest part of the aether (upper atmosphere), and are not compounded of any other element besides; they are of a fiery heat and translucent throughout. Hence they too have the fullest right to be pronounced living beings endowed with sensation and intelligence . . . The Stellae (Stars) occupy the region of aether, and as this has a very rarefied substance and is always in lively motion . . . Most marvellous [of all the stars of heaven] are the motions of the five Stars (Stellae), falsely called Planets (Planeta) or Wandering Stars (Stellae Errantes)--for a thing cannot be said to wander if it preserves for all eternity fixed and regular motions, forward, backward and in other directions. And this regularity is all the more marvellous in the case of the Stars (Stellae) we speak of, because at one time they are hidden and at another they are uncovered again; now they approach, now retire; now precede, now follow; now move faster, now slower, now do not move at all but remain for a time stationary. One the diverse motions of the Planets the mathematicians have based what they call the Great Year, which is completed when the sun, moon and five planets having all finished their courses have returned to the same positions relative to one another. The length of this period is hotly debated, but it must be necessarily be a fixed and definite time. For the Star (Stella) [planet Saturn] that is called Saturnus' [Kronos'], the Greek name for which is Phaenon (the shiner), which is the farthest away from the earth, completes its orbit in about thirty years, in the course of which is passes through a number of remarkable phases, at one time accelerating and at another time retarding its velocity, now disappearing in the evening, then reappearing in the morning, yet without varying in the least degree throughout all the ages of eternity, but always doing the same things at the same times. Below this and nearer to the earth moves the Star (Stella) of Jupiter, called Phaethon (the blazing), which completes the same circuit of the twelve signs of the zodiac in twelve years, and makes the same variations during its course as the star of Saturnus. The orbit next below is that of Pyroeis (the fiery), which is called the Star (Stella) of Mars, and this covers the same orbit as the two planets above it in twenty-four months all but (I think) six days. Below this in turn is the Star (Stella) of Mercurius (Mercury), called by the Greeks Stilbon (the Gleaming), which completes the circuit of the zodiac in about the period of a year, and is never distant from the sun more than the space of a single sign, though it sometimes precedes the sun and sometimes follows it. Lowest of the five Stars (Stellae) and nearest to the earth is the star of Venus, called in Greek Phosphoros (the Light-Bringer) and in Latin Luciferus (Lucifer) when it precedes the sun, but when it follows it Hesperos (Hesperus); this planet completes its orbit in a year, traversing the zodiac with a zigzag movement as do the Stars (Stellae) above it, and never distant more than the space of two signs from the sun, though sometimes in front of it and sometimes behind it. This regularity therefore in the Stellae, this exact punctuality throughout all eternity notwithstanding the great variety of their courses, is to me incomprehensible without rational intelligence and purpose. And if we observe these attributes in the Stars (Stellae), we cannot fail to enrol even them among the number of the gods." "You say that Sol the Sun [Helios] and Luna the Moon [Selene] are deities, and the Greeks identify the former with Apollo and the latter with Diana [Artemis]. But if Luna (the Moon) is a goddess, then Lucifer (the Morning-Star) [Eosphoros] also and the rest of the Wandering Stars (Stellae Errantes) will have to be counted gods; and if so, then the Fixed Stars (Stellae Inerrantes) as well." "[The witch Medea casts a spell :] Medea . . . than whom is none more potent at the nightly altars [i.e. casting magic spells]; for responsive to her cry and to the juices she scatters in desolate places the Stars [probably the five Planets] are halted trembling." "Now nine times had Lucifer [Eosphoros the Dawn-Star] chased the dewy Astra (Stars) from heaven." "But even deities have their laws : in thraldom the swift choir of the Astra (Stars), in thraldom is wandering Luna (the Moon) [Selene], not unbidden is the light whose path so oft returns [Sol-Helios the Sun]." "As he [Phaethon, son of Helios the Sun,] sprang from the childbed, the daughters of Okeanos (Oceanus) cleansed him, Klymene's (Clymene's) son, in his grandsire's waters, and wrapt him in swaddlings. The Stars (Asteres) in shining movement leapt into the stream of Okeanos which they knew so well [i.e. the stars set in the river Okeanos], and surrounded the boy, with Selene Eileithyia (the Moon Goddess of Childbirth), sending forth her sparkling gleams." "[Helios instructs his son Phaethon in the driving of the chariot of the sun :] ‘There are twelve houses in all the fiery aither, set in the circle of the rounded Zodiakos (Zodiac), one close after another in a row, each separate; though these alone is the inclined winding path of the restless Planeta (Planets) rolling in their courses. All round these Kronos (Cronus) [i.e. the planet Saturn] crawls from house to house on his heavy knees along the seventh zone upon the circle, until at last with difficulty he completes thirty circuits of returning Selene (the Moon) [i.e. two and a half years]. On the sixth, quicker than his father, Zeus [i.e. the planet Jupiter] has his course opposite, and goes his round in a lichtgang. By the third, fiery Ares [i.e. the planet Mars] passes [one sign of the Zodiac] in sixty days, near your father [the Sun]. I myself [the Sun] rise in the fourth, and traverse the whole sky garland-wise in my car, following the winding circles of the heavenly orbits. I carry the measures of time (khronos), surrounded by the four Horai (Horae, Seasons), about the same centre, until I have passed through a whole house and fulfilled one complete month as usual; I never leave my journey unfinished and change to a backward course, nor do I go forward again; since the other Asteres (Stars), the Planeta (Planets), in their various courses always run contrary ways: they check backwards, and go both to and fro; when the measures of their way are half done they run back again, thus receiving on both sides my one-sided light [i.e. half the planets, including the moon, lie above the sun and half below, so each receives his light on one side only.] . . . When you begin your course, pass close by the side of Kerne (Cerne), and take Phosphoros (the Morning Star) as guide to lead the way for your car, and you will not go astray.’"
"[Harmonia describes the ancient Tablets of Phanes which contained cosmic propheciesset down by the primordial creator-god Ophion-Phanes :] ‘I have oracles of history on seven tablets, and the tablets bear the names of the seven planets. The first has the name of revolving Selene (the Moon); the second is called of Hermes [i.e. the planet Mercury], a shining tabled of gold, upon which are wrought all the secrets of law; the third has your name [i.e. Aphrodite the planet Venus], a rosy tablet, for it has the shape of your star in the East; the fourth is Helios (the Sun), cental navel of the seven travelling planets; the fifth is called Ares [i.e. the planet Mars], red and fiery; the sixth is called Phaethon [i.e. the planet Jupiter], the planet of Kronides (Cronides) [Zeus]; the seventh shows the name of highmoving Kronos (Cronus) [i.e. the planet Saturn]. Upon these, ancient Ophion has engraved in red letters all the divers oracles of fate for the universe.’"
The five Planeta were sometimes worshipped in conjunction with the Sun (Helios) and the Moon (Selene) as gods presiding over the seven zones of heaven. "On the road from Sparta to Arkadia (Arcadia) . . . is what is called the Tomb of Horse. For Tyndareus, having sacrificed a horse here [to the Sun, Moon and five Planets], administered an oath to the suitors of Helene, making them stand upon the pieces of the horse. The oath was to defend Helene and him who might be chosen to marry her if ever they should be wronged. When he had sworn the suitors he burried the horse here. Seven pillars, which are not far from this tomb . . ((lacuna)) in the ancient manner, I believe, which they say are images of the Planeta [i.e. the five Planets alongside the Sun and the Moon]." The seven gates of Thebes were dedicated to the Sun, Moon and the five Planets (Mercury, Venus, Mars, Jupiter and Saturn). This naming is only recorded in the epic of the late antiquity poet Nonnus and may not be authentic. "He [Kadmos (Cadmus) founder of Thebes] dedicated the seven gates [of the new-founded city] to the seven planets. First towards the western clime he allotted the Onkaian (Oncaean) Gate to Mene (the Moon) [Selene] . . . The second gate he gave in honour to Hermaon [i.e. the planet Mercury], the shining neighbour of Mene. The fourth he traced out and named for Elektra (Electra) Phaethon's [Helios the Sun's] daughter, because when he appears, Elektra's morning gleam sparkles with like colour; and the midmost gate opposite the Dawn he dedicated to fiery Helios, since he is in the middle of the planets. The fifth he gave to Ares [i.e. the planet Mars], the third to Aphrodite [i.e. the planet Venus], in order that Phaethon [the Sun] might be between them both on either side, and cut off his neighbour the furious Ares from Aphrodite. The sixth he made an image of Zeus [i.e. the planet Jupiter], shining high with more glorious craftsmanship. The last fell to the lot of Kronos (Cronus) [i.e. the planet Saturn] the seventh planet." Greek Papyri III Anonymous, Fragments - Greek Poetry C3rd - 1st B.C.